VSI series sand making machine is the leader in artificial sand making industry. VSI series sand making machine is a perfect combination of the latest research achievements made by authoritative experts in German and the practical conditions of Chinese working site. Being the updated and perfected new generation sand making machine, it is the 3rd sand making machine with advanced technology of world class, which is only produced in Shanghai Shunky. VSI series sand making machine can be used to provide premium gravel aggregate for the construction of highway, high speed railway, high-rise buildings, infrastructure, Hydropower dam, concrete batching plant etc. As preferred machinery in the field of artificial sand making and stone shaping, long- term accumulation of technology and the fine production achieved by modern equipments, Shunky VSI sand making machine stands in the leading position in this industry. It’s supreme cost performance and reliability makes it stands out from its peer products. 1.Large processing capacity and high capacity of ideal output: 50-500 t/h, output increases by 30% compared with the traditional equipment using same power, and VSI sand making machine works more stably. 2.Low consumption of wearing parts- excellent designed impact angle in crushing chamber reduces the frication between wearing parts and materials, consequently operation cost can be reduced by 30%. 3.Fine shape of final product- good cubic shape, fineness modulus can be adjusted, especially suitable for artificial sand making and stone reshaping. It is proved that the reshaping achievement increases by 30% compared to other traditional equipments. 4.Hydraulic drive system is convenient to maintain, hydraulic cover opening device makes it more convenient and easier to replace the wearing parts in crushing cavity and decreases the downtime, thus saves time and energy. 5.Automatic monitoring equipment is safe and reliable: Vibrating and alarming device will warn and turn off the crusher to protect it. 6.Thin oil lubrication and automatic maintenance: thin oil lubricating station from German makes sure the supply of the oil with double oil pumps. The machine can stop working without oil or hydraulic pressure. Heating and cooling oil device assure the bearing’s lubrication is at its best. The bearing over-heat protective function makes the main bearing keep in a constant temperature and have a long service life. 7.Simple installation and easy operation: it is light in weight and has diverse means to install. It is very easy to install, maintain, use and repair. When the concrete purpose is set, it just needs tiny adjustments to make full use of it. 8.Multi-purpose machine, flexible application: unique crushing structure together with wide ranges of crushing chambers can make stone hits stone and stone hits iron simultaneously. If we have different purposes, we just need to adjust a few parts; we could use it for artificial sand, sand reshaping etc. 9.International quality guarantee: it adopts Germany advanced technology, advanced riveting technology, abrasive blasting, rust removal and spray paint in automobile making, which greatly improves inner and exterior quality. Moreover, core parts adopt world famous brand (bearing uses the high-accuracy class TIMKEN antifriction bearing) with fewer errors. 10.Environmental protection: the automatic air circulatory system makes lower noise, less dust. 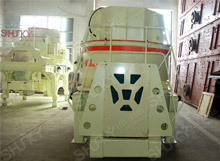 Besides, VSI vertical shaft impact crusher can be installed with kinds of dust-cleaning devices. Safety To make sure the supply of the oil with double oil pump; Stop working without oil or hydraulic pressure; Temperature falls when the water cools; Start the motor by heating it in winter.